Well, we made it to Pennsylvania in one piece. This has been the longest we have gone without updating everyone, sorry it took so long. I hope no one was too worried. Since last updating you in Connecticut , we hiked straight through New York and New Jersey without taking any showers. These states were not as spectacular as we may have liked them to be, but they held there own little highlights so to speak. Rather than give you a day to day break down and take up hours of your time, we will just touch on some of the cool things. First off, the heat wave that we had through New York was a nice break from the cold, but it also brought a lot of miserable rain. I would rather the cold than the rain to be honest. 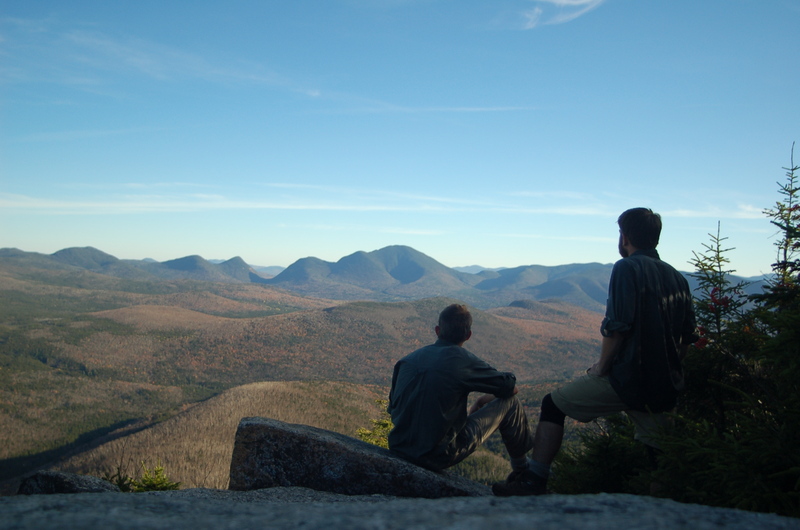 We hiked with “Early Bird”, another south-bound thru-hiker (or a SOBO), for a few days. A 4th personality was nice for a while. While staying at the ball fields courtesy of the Graymoor Monastery, we stumbled upon ruins of a once immaculate garden and sanctuary. We offered to volunteer some of our time to clean up some of the debris, but we were told that the ruins were to be completely removed at a later date, what a shame. Veteran’s Day was a disaster, the post office was closed, so we couldn’t pick up our mail-drop nor send anything home that we didn’t need. Luckily, Alex, a hiker we met in Maine , lived nearby and took us to a grocery store to pick up what we needed to get to Unionville. Not all of Veteran’s Day was a disaster, the weather was beautiful, and we got to mingle with society. The trail goes through the Trail side Museum and Wildlife Park, so we got to learn about all the different geology and wildlife of the region. 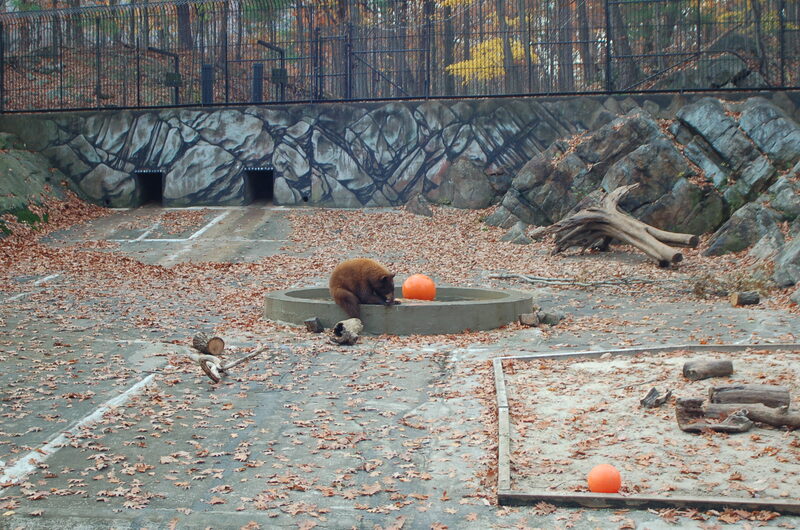 The lowest elevation of the AT is in front of the black bear exhibit (124 feet). After that, we came out into Bear Mountain. park with a huge lake, a wide open green space, an ice-skating ring, and our favorite; concessions. After two soft pretzels, two hot dogs, and talking to lots of people, we climbed up Bear Mtn in hopes of a glimpse of the NYC skyline less than 40 miles away. The sun had set when we reached the top and the fog had rolled in, so no luck on the skyline. We still had another 4 or 5 miles to do over to West Mtn. in the dark. The hike wasn’t too bad and it went fairly fast, but when we came close to the top, smoke and the smell of fire filled the air. I was honestly kind of worried there was a forest fire nearby, but it was just 40 or so boy scouts camping near the shelter. On Monday we called the post office, and they assured us that they would forward our package to Unionville, awesome. We made it into New Jersey and the trail opened up and we were able to make some good time. Wednesday night, just before we were going into Unionville, we found out the package never left the last town. They made sure it was there for us to pick up Thursday morning, but only 2 of the 3 packages made it (actually we are still waiting for it to catch up). We got to enjoy some small town hospitality and good home-style cooking at Sara’s Soda Shop. She had about 400 hikers come through this year, amazing. We hung around there for lunch and used a corner of the shop as a base while we ran to the post office and grocery store. The locals warned us of the 2-5 inches of rain headed that way, so we hurried outside of town to the first shelter. The shelter is actually a “secret shelter” that is built on Jim Murray’s property for thru-hikers only. It was done up real nice with electric, running water, and a shower. He also had a couple of donkeys in the field that kept bellowing out coarse sounds whenever the rain would stop. The trail from then on was easy. One morning we stopped by a farmer’s market next to the trail and ate a big cherry pie, oh so sweet. The day before last a big group of boy scouts stayed outside of our shelter. They didn’t even say hello, which has actually been a common occurrence for us in Jersey. Yesterday was a big day, we woke up at 3 in the morning and started hiking, so we could finish the 25 miles into town before 4 in the afternoon, it was our biggest mileage day so far. We had to walk over the I-80 bridge into PA over the Delaware River , and the cars were just flying by, weaving in and out of each other. They weren’t doing anything we wouldn’t have normally done, but to us, it seems so scary and dangerous. We haven’t moved that fast in a while. We are staying in the basement of a church, they setup a small hostel for thru-hikers with a sitting area, bunk room, and hot showers. It is a wonderful place. Last night, we both slept on the leather couches instead of the bunks, so comfortable. We will hit the trail again in the morning for a couple days until we meet Ice Man’s parents for thanksgiving on Thursday. We are excited that they are coming up. Hopefully they will do some hiking with us and check out one of the shelters. We also caught wind that some of our friends might be coming up at the end of the month to visit, its all too good. This exert was originally published on atwishhikers.com. It’s content has not been edited from the original post. I’m not sure who got the joke in that second paragraph, but the fourth personality between three of us included my second self. New York I think is when I started going cuckoo. The time was really wearing on us and the rainy days were getting us down. There was one day where I felt like I was stumbling from tree to tree leaning on each to take a break. It was partially the fatigue but it was mostly mental, I was actually pouting while hiking. Talking to myself seemed to help, but eventually I think I just accepted my new lifestyle. The ruins at our church camp were almost maddening. Joe and I each discussed the unfair fate of the hillside garden. There were several trails from the bottom of the hill leading up to the church, each one with it’s own unique statues. We imagined the hillside restored, the statues picked up, the brush cleared, and new flowers and plants growing. What was once a path for prayer and meditation with old and original character was abandoned and was to be bull dozed. Still a bummer. What I remember still of New York is all about the crowds of people we would see and how awful the water tasted. I attribute the water to farm run off as we pass a lot of low lying streams near farms. Watching cow patties instead of roots and rocks wasn’t welcoming. If I were to describe New Jersey I think of giant scout troops, even more bad water, and that damn donkey outside our shelter. although it is funny now he made it real tough to sleep at night. The only real problem we had with shipments came with holidays and post office closures. I will say that hiking was made so much easier with that support and the willingness the USPS has to help. It is sad that now many of these post offices are closing. It also didn’t hurt to have your father, a postman, as a support crew back home mailing things out, thanks again Pops! Sara’s Soda Shop was more than accommodated while we waited and you’ll find that kind of courtesy at almost all of the small towns and shops along the trail. At the end of the post I also talk about the excitement that is coming over us as we anticipate family and friends coming to see us. This honestly got us through some days on the trail! It is so comforting and touching to know that we had the support crew to come see us. Joe and I would often talk about it, day after day, “who is coming down you think?”, “What do you want to do when our friends come?”, “Do you think (unmentioned exgirlfriend) is coming?” , these and many other questions filled our days with excitement and wonder. It has been about 10 days since we began hiking in Vermont , and tonight we will camp just a few miles from the border of Massachusetts . Vermont has been such an amazing and unique state in comparison to Maine and New Hampshire . Vermont didn’t have all the spectacular views and glorious climbs, but it had simpler gratifying aspects. 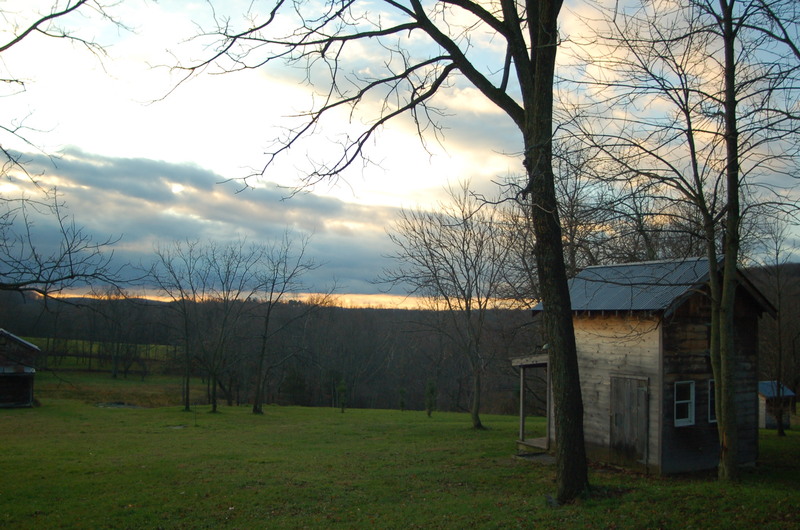 Much of the trail has passed through farmland, open fields, cattle ranches, and maple syrup harvests. To us they seemed like rolling hills, but somehow we found ourselves exhausted and stopping after a dozen miles two days in a row. Our expectations to push out serious miles were perhaps too great to live up to just yet. With rain both days we would call it quits and hang out in our shelters for the remainder of the day. It was then we had met “Stitch”, a 19yr old from Chicago , he is finishing his thru-hike down to Hudson river . It was nice being alongside another hiker for a few days and share a few laughs while jammin’ out to our new transistor radio. Ice Man and Stitch would take part in the first ever Winturri Shelter Putt-Putt Classic. Despite the early lead with a shot off the top of a water bottle, Stitch took the prize with a shot up a ramp from the farside of the shelter. The next day the three of us decided to push harder and go 18 miles to get to an irish pub and grill just off the trail. The day flew by and the miles were well worth the hot sandwiches and cold soda. It was too dark and we were too tired after dinner to hike to another shelter, so we camped just across the street in the woods. The night was warm, but it rained non-stop. Not only was the tent soaked, but somehow so were our sleeping bags. The four different weather forecasts we were picking up said anything from on and off showers to flash flooding all day. That’s all it took. We decided to go into Rutland and stay at the Back Home Again Cafe and Hostel. It is a “work for stay” hostel operated by the 12 tribes religious community. Their hospitality was unbelievable. We took the day to dry out our gear and relax. Later that day we helped them paint some woodwork and hang drywall in exchange for our stay. The following day, we enjoyed some donuts and bagels before going back to the trail. The trail immediately started with a climb up Mt. Killington . Nearly the entire 12 miles up and over the mountain was in 2 inches of snow and ice. It was really exciting to finally get a taste of what was to come. The following day just got us a little closer to our resupply point in Wallingford , so the following day we could just go in and out of town. We picked up our package and got a ride back to Rutland to resupply at the store. On the way back to the trail, Tom, the gentleman that took us into town, offered to pick us up after we finished another 8 or 9 miles to the next road and take us back to the hostel for the night. We couldn’t pass up the offer, but we would end up semi-regretting coming back to town. After dinner, we helped in the bakery until close to midnight, so we didn’t really get all the sleep we were hoping for. The next 3 days were long and cold. We ended up at 60 miles in those 3 days even through the snow. We picked up another layering of clothing to sleep in, so now we just have to keep our feet dryer and warm. We came into town last night because the road wasn’t too far from the shelter, all of our socks were soaked, and we had heard about a free place to stay. It was actually a barn that was renovated into basically a nice little hang out with a pool table and radio. We hit up the outfitter, the laundromat, and now the library. I think that is everything in a nut shell. I wish we had more time to write these journals. I feel like we leave some many details out. We can’t upload pictures this time, but hopefully soon enough. Oh, I almost forgot. We are now 578 miles in, 51 days, and more than 25 % completed. Luckily, we only have 11 miles to push out today because its already 1 in the afternoon. We will cross into Mass. tomorrow and pickup our package in North Adams . Stitch had found the plastic putt putt inside a shelter and had been traveling with it for a little while. I gotta say it was one of the more fun, and unexpected moments that we would have. The day that we had met Stitch we had only sat at the side trail that goes toward the shelter to eat our lunch. It was one of those days where you just didn’t want to do anything. Off in the distance we heard a loud commotion, there was banging and screaming that seemed must of been from a group. We took the side trail to the shelter to find that only one guy was there, and that’s how we met Stitch. He had been going crazy in his loneliness and just started jumping around hitting the broom against the shelter walls and shouting. This isn’t unique to Stitch however, I wouldn’t expect many individuals could hike alone for days none the less weeks or months and not get a little whacky sometimes. Hiking is a true test to mental health more so than physical health, especially when you hike south and it’s winter. We only hiked with him for a few days before he was swallowed up by the Back Home Again Hostel. There was a “creeper” there that convinced him to have a spa day and stick around, the poor kid just wanted to lay in a hot tub for a while. There are not many trail creepers but you’ll know them when you see them. This guy liked to walk around naked in the hostel and treated the place more like a homeless shelter or hideaway than a hiker hostel. Needless to say we took off. We know now that the barn shelter is one of the favorite hot spots during the peak season for hikers. Camping space, electricity, and walking distance to a Friendly’s is all the more reason you need. He was actually closed for the season and we were lucky to catch him in town for a place to stay. These were trying times for the two of us. The rain was cold but not quite snow most days so staying warm and dry was hard, the worst case scenario really for hypothermia, and this was just our first taste of it. The rolling hills were deceiving because they made you expect too much of yourself. Just because the terrain looks easier doesn’t mean that it will go buy twice as fast. I think I was still struggling with the new idea of time and distance that wasn’t marked by peaks. It has been a while since you last heard from us in Andover , Maine . I’ll start from the beginning I guess. The first few days out were also our last in Maine . The first day, the weather was incredible and we tackled two 4,000 ft + peaks in 15 miles. We were so excited to have done so much over that terrain, but the following day put us in our place. The Mahoosuc Notch, the hardest mile on the whole trail, took us 3 hours to do a mile. 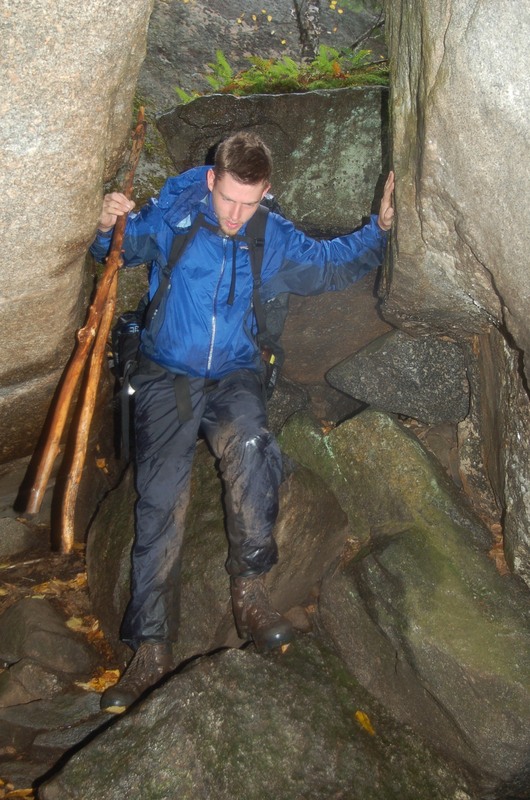 It was nothing but climbing over, in between and under boulders, of course it was wet too. We had a few close calls, but only a bumped head and some scratches. That day we only went 5 miles before we called it a day. The following day was soiled with bad weather, yet crossing into New Hampshire and finishing our first state kept us in good spirits until Ice Man fell into the mud. His right leg missed a board and sunk into the mud up to his thigh. Luckily, his left leg was still on the board, otherwise, I don’t know how he would have gotten out. We called it an early day and stayed dry at the next shelter. We stopped in Gorham , NH for a dollar menu feast at Mcdonald’s and Dunkin’ Donuts in the morning. 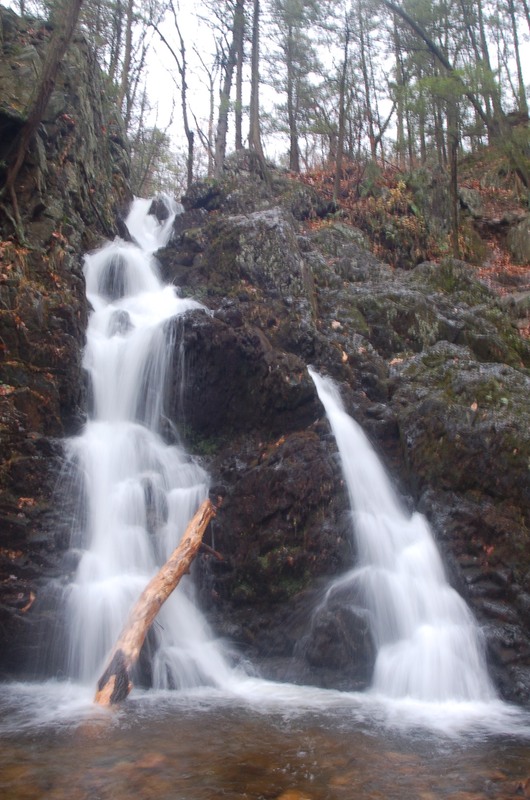 We had 2 and a half days until Pinkham Notch, which is the gateway to the Presidential Mountains. They were spectacular mountains to say the least. They are called the “wildcats” and the views the gave of Mt. Washington were incredible. Our second day in the wildcats, there was ice covering the whole north side of the mountains(the pics turned out great). We have had nothing but the best weather since we left Pinkham Notch. Locals say that the weather we had going over the Presidential Mountains and Mt. Washington , was by far the best all year. This was the place we expected to be having the worst weather. We had warm days, clear skies, 120 mile + visibility, and winds of less than 10 mph for days. Not even the Columbus Day weekend crowds and tourists on the mountain could make us wish for better. We were down right spoiled. 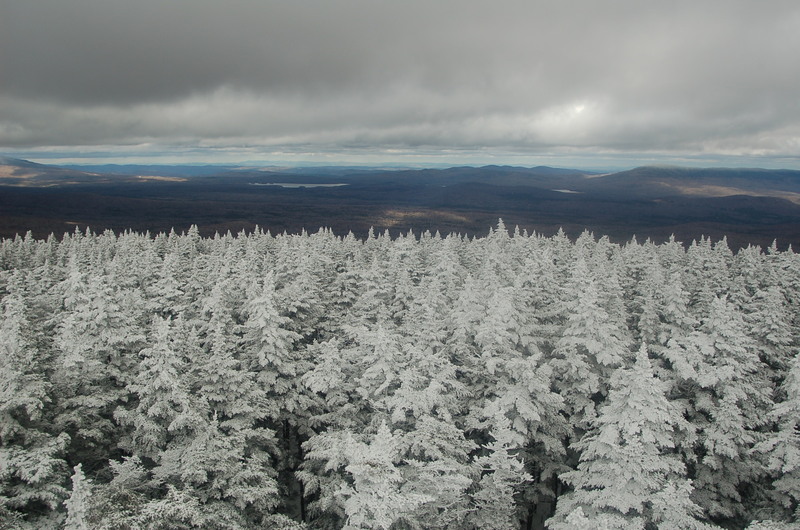 We hiked 2 and a half days above treeline in the White Mountains with unimaginable weather. Mt. 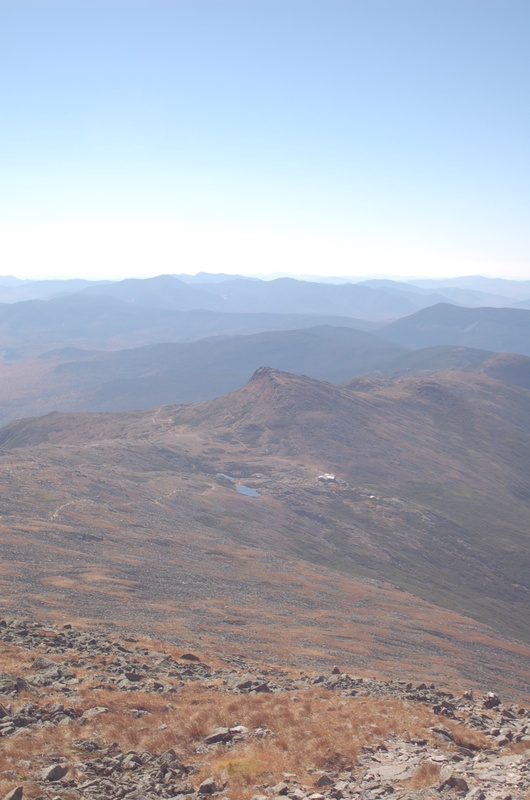 Washington put us over 6,000 feet at exactly one month since we had made the summit of Katahdin, a nice coincidence. A couple nights ago, we camped right on some cliffs, watched the sunset after dinner, and relaxed under the stars with hot apple cider. We stayed up swapping trail stories with a going to be “3 time” thru-hiker named Doc Knarley. Oh, he had some crazy stories. Last night, we spent a few hours relaxing on top of Mt. Garfield . We are going to miss these mountains. We rolled into North Woodstock today to refuel, and send you guys an update. We hope you enjoy these pictures. We love you all and wish you could be here. We have to catch a ride back to the trail soon. 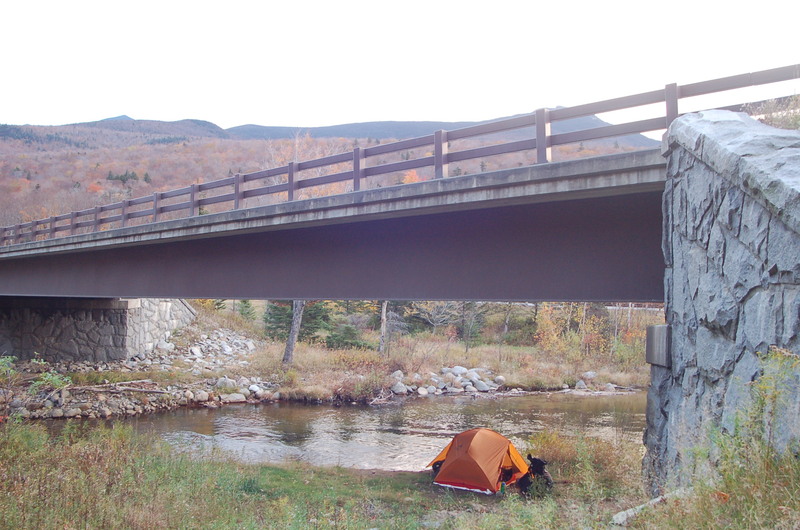 We figured we would “troll camp” tonight under the I-93 bridge. We hope to update you again in Hanover in less than a week. This is a big section to stop and reflect on and I feel like there are many untold stories. For starters; Mt. Success. I am over 6 feet tall and almost all legs, when we reached the top of cloudy Mt. Success the last thing I thought I’d encounter was a endless pit of doom trying to swallow me in the mist. The mountain even at the very top had wood planks to walk on to avoid the swampy mess but even those boards were covered by mud. I found myself poking the ground in front to find the boards before taking each step, to no avail. I fell (in a very flexible moment) over waist deep in mud while keeping my left foot still on the board ahead. Joe was up in front and after a try or two I had to shout ahead for help getting out. The mud and cold water was sinking into my boot making it feel like concrete holding me down. 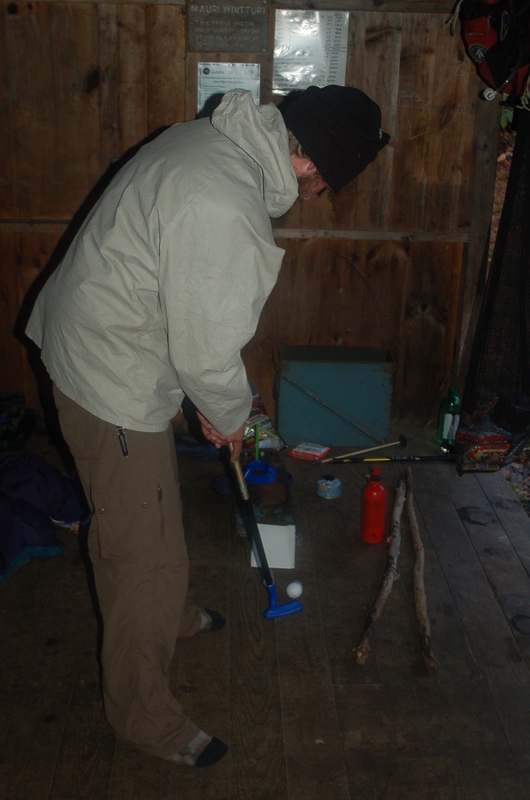 After getting pried from the depths and retiring to the following shelter, I was quickly warmed up from some trail magic: tequila! This whole section had chance encounters of booze carrying trail angels. Passing a flask of vodka back and forth with “Doc” on top of Zeacliffs near the hut made for one heck of a night! That had to have been the single most entertaining hiker we stayed with on the trail. As far as Washington, I’m not sure I could ever go back. If you ever are lucky enough to have that “perfect moment” than you don’t dare chance ruining it by going back.